Poison ivy, oak and sumac rash is caused by the skin's reaction to the plant's oil, urushiol (oo-roo-she-all). For effective treatment, you must first remove the urushiol oil to keep it from spreading and also treat the painful, itchy inflamed rash. 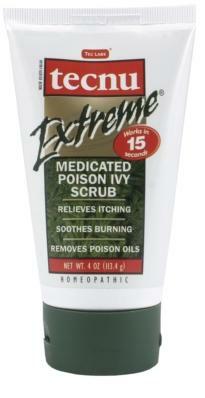 Tecnu Extreme is the first medicated poison ivy scrub that does both in one step. Washing with Tecnu Extreme for 15 seconds will remove urushiol oil left on the skin to keep it from spreading. Its unique homeopathic formula contains an active ingredient to relieve itching and soothe the burning rash.